Irish soprano Celine Byrne sings the role of Magda, the jaded Parisian courtesan who longs for real love. It’s no secret that Byrne had been working as an 18-year-old au pair in Milan when she encountered her first opera. Since then, Byrne has become one of Ireland’s foremost sopranos, performing extensively in Europe, the U.S., China, Russia, and Mexico. 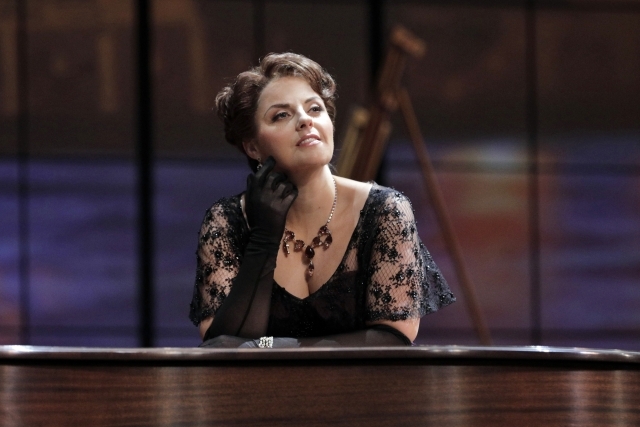 Celine Byrne as Magda in Minnesota Opera’s new production of La Rondine. Your first singing lesson wasn’t until you were 19, which is a bit unorthodox for most opera singers, and now you’re recognized as one of opera’s great stars. Has that later start given you any added perspective or drive? Celine Byrne: I think it has in many, many ways. Because I started late, I was never in any young artist program. I never had a place in any ensemble, so from the get-go, I’ve always been doing it my way. I started singing lessons late, and even was freelance from my stage debut in 2010. I have to say, doing my own thing has probably been a benefit to me because, not being part of a young artist program, I haven’t been given roles to learn. I’ve taken contracts on the basis of whether it was good for me vocally and time-wise. The fact that I started singing late has also been beneficial to me because I’ve been old enough and wise enough to take advice that benefitted me and to ignore advice that didn’t. I think, even now, my voice still sounds fresh and healthy because I’ve been careful about the projects that I’ve taken on. There are a lot of singers out there now that have big vibratos in their voice because they’ve overworked their voice or they’ve sung the wrong repertoire. So starting late, in many ways, has been a benefit to me. La Rondine is often overlooked by many major opera houses in favor of other works by Puccini. Why do you think that is? CB: I don’t think it should be ignored, and I do feel it’s been performed more in recent years. I think people may not have performed it because it was viewed as an operetta, which is totally wrong because, originally, yes, it was written as an operetta in German, but then it was reverted back to Italian and the music is still Puccini. His signature is still all over it. I have to say it’s an amazing one and it’s actually quite challenging vocally, because the aria in the very first 10 minutes is quite high in the tessitura of the voice. I don’t know why it’s been overlooked because it is still one of his best works. It’s absolutely passionate, it’s beautiful. It can be interpreted in many different ways as well. The music is so luscious, I don’t think it can be ignored, and I think it’s becoming more popular, which is a great thing. 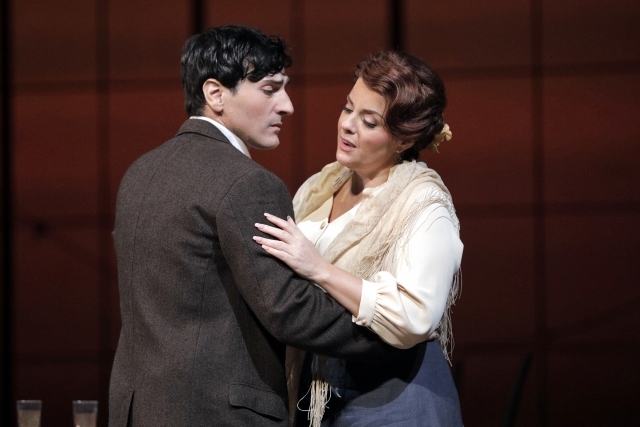 Leonardo Capalbo as Ruggero and Celine Byrne as Magda in Minnesota Opera’s new production of La Rondine. How do you describe Magda? What does her character represent to you? CB: With any character, and my approach to any project that I’m doing, I try to understand her. Where she is in life at the time that Puccini wrote this—what kind of character was he thinking of at the time? I also try to inject my own personality into it as well. I try to create something in the role that I can identify with. I try to make Magda my own Magda, within the vision of what the director wants and what the conductor wants. So this Magda, for me, is a very touching Magda. I think she’s very vulnerable and we can see that in certain scenes within the opera. I think the audience will love her. In some ways they will empathize with her and the situation she’s in. The way that I portray it is that, toward the end when she makes the decision not to follow her heart but to follow her head, throughout the journey we can see why she did that in the end. That’s what I’m trying to do: I’m trying to convince people that she’s really vulnerable and she’s got a heart full of love and that people can identify with her. What are some of your joys and challenges of portraying Magda? CB: The biggest joy is the fact that it’s Puccini and this beautiful music of Puccini in this verismo style is something that I love to sing as an artist. It’s my favorite music to sing—Puccini—because he did it so well. But the challenge of this opera, in particular, is the tessitura of the very first aria. Really this role is technically quite challenging, as it is very, very low, and it goes very, very high. You really have to have a huge range to sing this. It’s very dramatic and yet there’s some beautiful soft moments in the piece. And if you can’t sing them, then you can’t master his music. So it’s a challenge, but an enjoyable one. I love it! Magda’s storyline doesn’t end the way many leading ladies do: dying one way or another. How does Magda returning to her life as the “kept woman of a wealthy man” fit into the larger lexicon of opera and how audiences relate to her? CB: With all Puccini’s opera, yes, the female character, most of the time, takes her own life. In this, I tried to keep in line with Puccini and his stylistic approach, the way he writes his characters. And in some ways, I do die. Because a piece of me dies when I decide not to stay with my lover. In several productions, we see Magda drowning herself when she walks into the sea—that has been directed before. The way that I play this character is that, at the end, her final note is one note that she sings the word “ah” to. In many productions, this “ah” is interpreted as her opening her arms and metaphorically looking like la rondine, the swallow returning to the nest. That she goes back to her wealthy empresario. But the way I want to play this, and the way the director has allowed me the freedom to do so, is that I’m not singing this one note as a kind of release in that I’ve made the decision to go back to the empresario. I sing it as a kind of breakdown, as a dying within herself. The falling apart. The breaking of the heart. The shattering of dreams. She’s a broken woman, and that’s the way I play it. Thankfully the director has allowed me to do that. La Rondine runs at The Ordway Centre for the Performing Arts Oct. 6–14. For more information and to purchase tickets, head to www.mnopera.org.